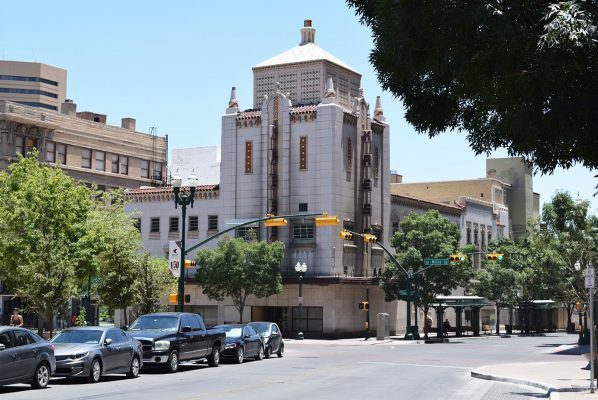 EL PASO — Many historic downtown buildings are in a state of neglect and disrepair, including some designed by prolific, well-known Southwest architect Henry C. Trost. Among the landmarks in serious neglect are several Trost buildings, and the Kress Building, designed by architect Edward F. Sibbert, said Morris Brown, a Texas Tech professor and architect. 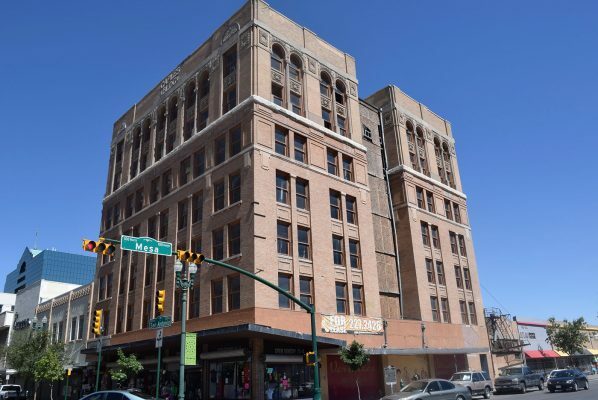 According to the El Paso County Historical Commission, 12 buildings within the downtown area are “endangered,” a condition the commission defines as in risk of architectural and interior deterioration. Four of these 12 are registered in the National Register of Historic Places. The upper floors of some of the buildings are empty, while bottom floors are rented to vendors selling trinkets, clothing and other merchandise. Kress building in downtown El Paso. Kress Building, 100 Mills Ave.
Kress operated as a “five-and-dime” from the 1930s to 1980s when it bustled with customers waiting to be served at the diner counter. The five-and-dime not only provided memories for patrons such as Whittington who also went to enjoy the unique architecture. Built with touches of Spanish and Moorish influences, including colorful Spanish tiles and finials similar to the towers of Muslim mosques, the Kress building was Sibbert’s favorite. Today, the Kress stands vacant with empty window displays filled with dust and litter, torn awnings and its doors locked with chains. The Richard Caples Building, one of the four structures on the 12 most endangered buildings list, was designed by noted architect Henry C Trost. Photo by Paris Saenz, Journalism in July. Richard Caples Building, 300 E. San Antonio Ave. The Caples building was designed by Trost, who is known for his various styles of architecture throughout the Southwest region. It was the first cement-poured building in El Paso. However, within its brown brick facade and Romanesque-accented windows lies a hidden history of the Mexican Revolution. During the 1910s, Abraham Gonzalez organized the Madero Junta, a group of revolutionaries backing the Mexican reformer Francisco Madero. Group members, including Francisco “Pancho” Villa, raised money for arms and ammunition. They met in offices 507 and 508 in the Caples building to organize the assault on Juarez in 1911. The Caples Building also served as the operation base for the Mexican revolutionary newspaper, La Regeneración. Today the building remains empty in its upper levels and exhibits signs of neglect on its exterior. On its exterior, brick tiles are missing on the ground level, a plyboard wall closes off one side of the U-shaped building and broken bricks can be found along the walls. Several other buildings show similar deterioration but still remain landmarks in the El Paso downtown area. “They are the best of the best, they are like jewels waiting to be discovered, mummies waiting to be brought back out,” Brown said. Student at Loretto Academy. Member of 2016 class of Journalism in July at UT El Paso.